Over the past three decades, barely a year has passed where Nova Peris has not displayed excellence in some area of her life. Certainly, she has seldom stood still, always determined to educate and re-educate, in order to give herself the best possible opportunity to not only develop her own prospects in life, but, equally as importantly, those of her people throughout Australia and the Torres Strait Islands. Whether in sport, federal politics, or any number of former and current work environments, Nova has remained at the forefront of the conversation for the best part of 30 years. Indeed, she has led the conversation! Nova was a trailblazer in her sporting pursuits, competing at Olympic level in two sports while juggling the demanding role of being a young mother. 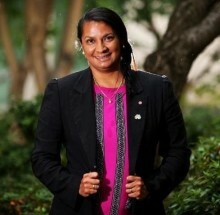 Then, post her sporting career, she smashed through another glass ceiling by becoming the first Aboriginal woman elected to Federal Parliament. Since the mid-1990s, she has spoken regularly on the plights facing Aboriginal people and has visited hundreds of communities throughout Australia to gain as much of an insight as possible into the issues facing people from all walks of life. Utilising the significant platform of Federal Parliament, in particular, Nova has given a voice to thousands of people who otherwise go unheard. She has undoubtedly made an enormously positive and life-changing impact on young Aboriginal people, not just through her words but also her actions. Her ability to be able to speak equally with people from all socioeconomic backgrounds gives Nova a unique approachability and relatability that sets her apart from many with similar platforms and responsibilities. Nova is certainly an inspirational and brilliant role model for Aboriginal and Torres Strait Islander people.